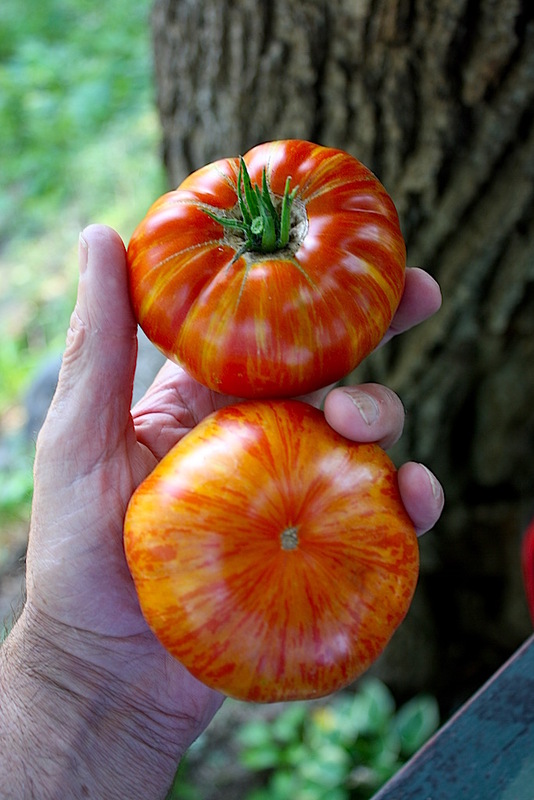 Over the last few years we’ve made many dozen crosses between various striped types and the best tasting heirlooms. Most of the striped parents were from Brad Gates at Wild Boar Farms, but there were others too. 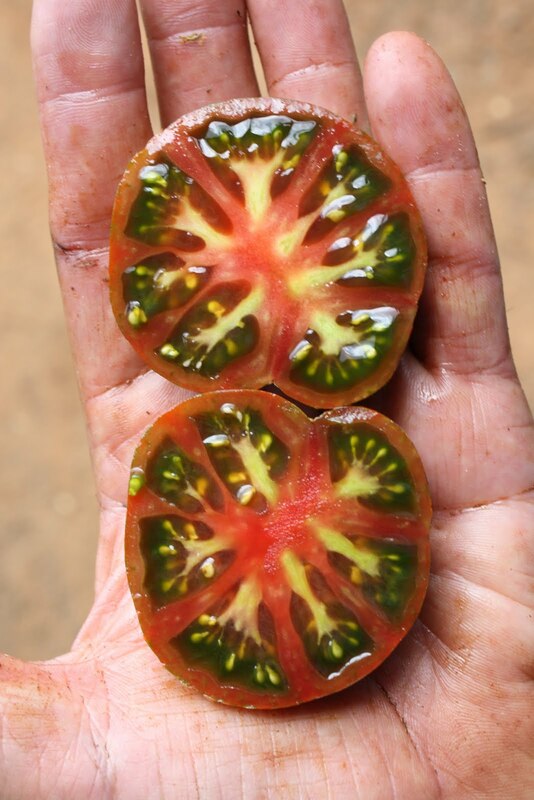 In studying the F1 and F2 progeny from these crosses, reading what is in the literature, and listening to the experience of a couple respected colleagues – here’s what we’ve learned about genetic control of stripes in tomatoes. 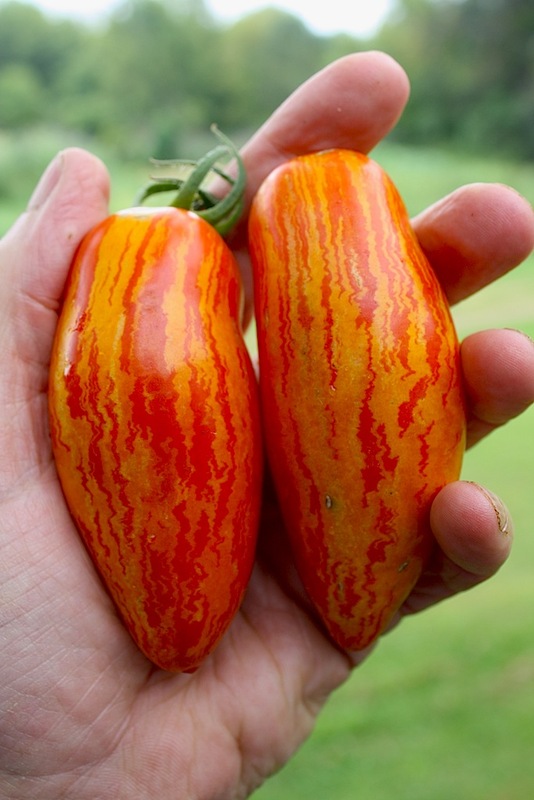 We believe there are at least three different patterns for fruit striping in tomato, all under different genetic control. All three result in tomatoes that are striking in appearance, and since there seems to be no relationship between fruit stripes and taste or horticultural traits, a tomato can be both great looking and great tasting. 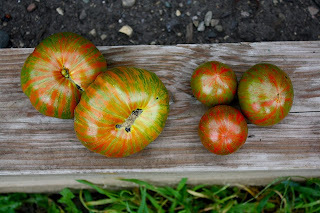 According to the Tomato Genetic Resources Center (TGRC) the green stripe (gs) gene causes "irregular longitudinal green stripes in the epidermis of unripe fruit; retaininng chlorophyll for longer period during ripening, and eventually assuming paler color in fully ripe fruit; changes limited to the epidermis". 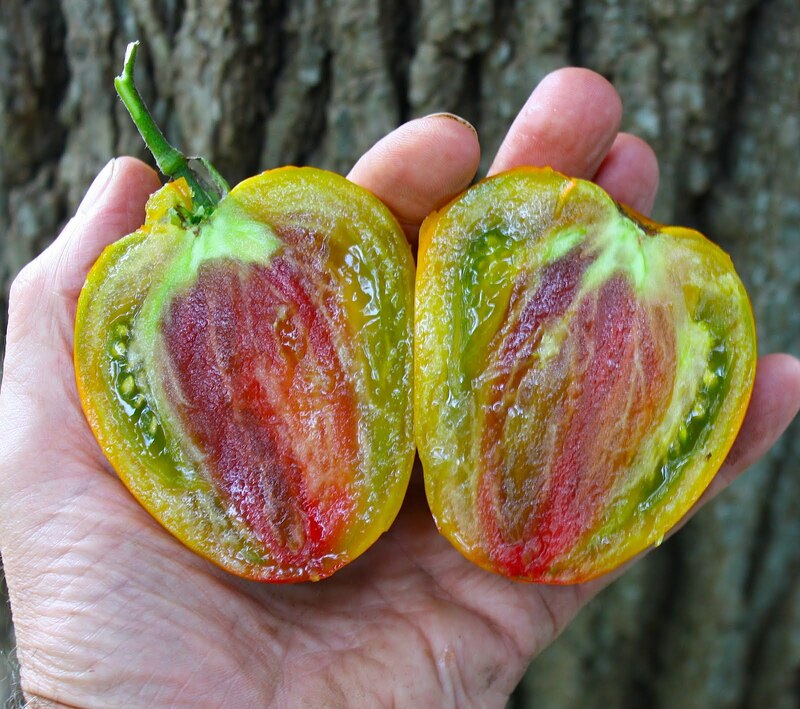 Generally the color of the stripes in mature fruit is green in fruit with the gf trait (purple, brown and GWR flesh types with retained chorophyll)) and yellow in non-gf types (e.g. red and yellow). There are exceptions. The pattern and boldness of the stripes can vary widely. Casady's Folly shows bold lightning bolt-like stripes. 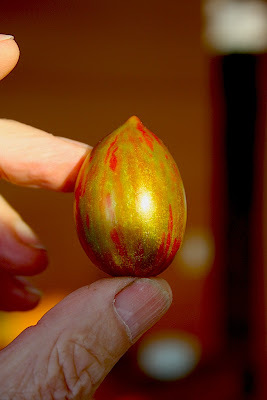 Others appear to be washed with a gold or metallic green paint (conditioned by gs), with the underlying fruit color appearing as stripes (see photos below). 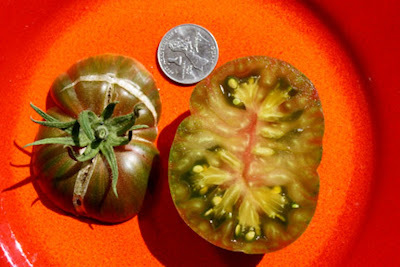 Although the gene is generally considered to be recessive, the gs/+ heterozygote may show faint striping - but not always. Clearly there are one or more genes interacting with gs which provide for the rich diversity of striping color and patterns. 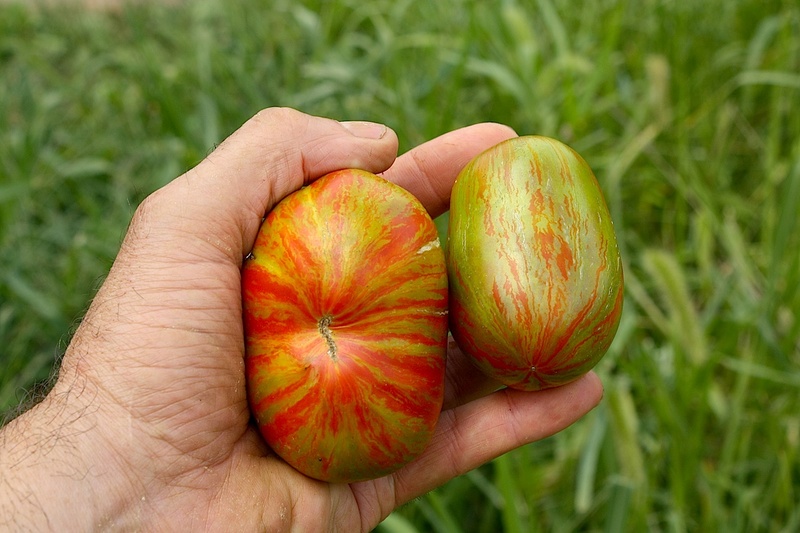 We know now for example that in anthocyanin fruit (Aft) types the anthocyanin pigment accumulates preferentially in the green stripes - evident in both green unripe and ripe fruit. 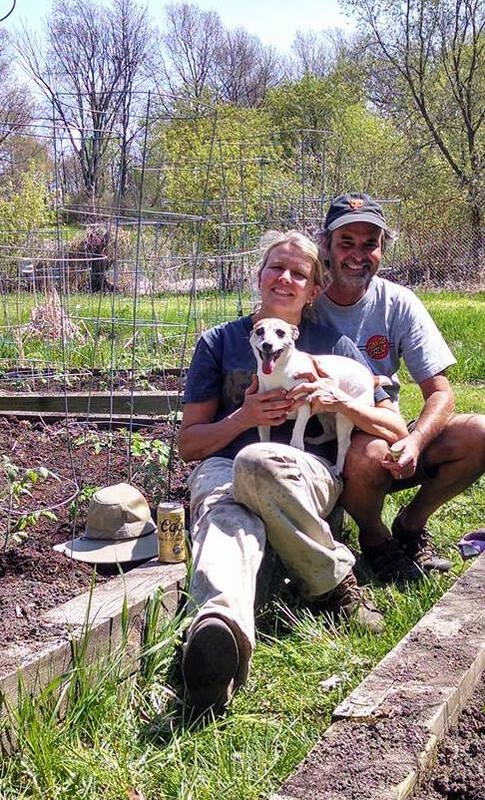 Some examples of the diversity are shown in photos below. 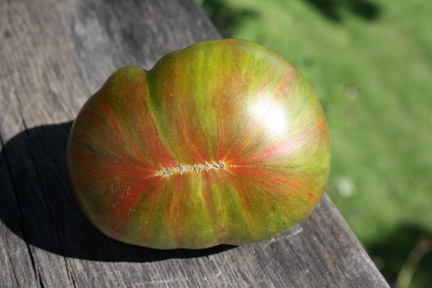 The fruit stripe gene (Fs) causes dark green radial stripes opposite the fruit locules. 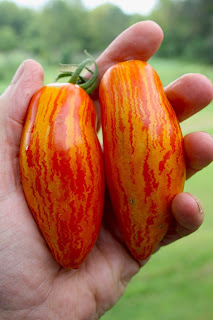 These radial stripes tend to fade as the fruit matures. 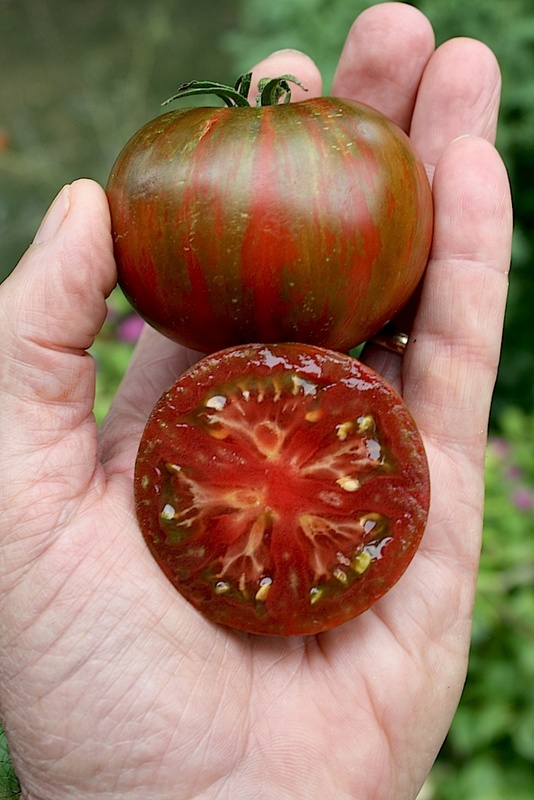 I have only seen radial stripes on ripe fruit on green flesh (gf) types, for example Indian Stripe or Arbuznyi. 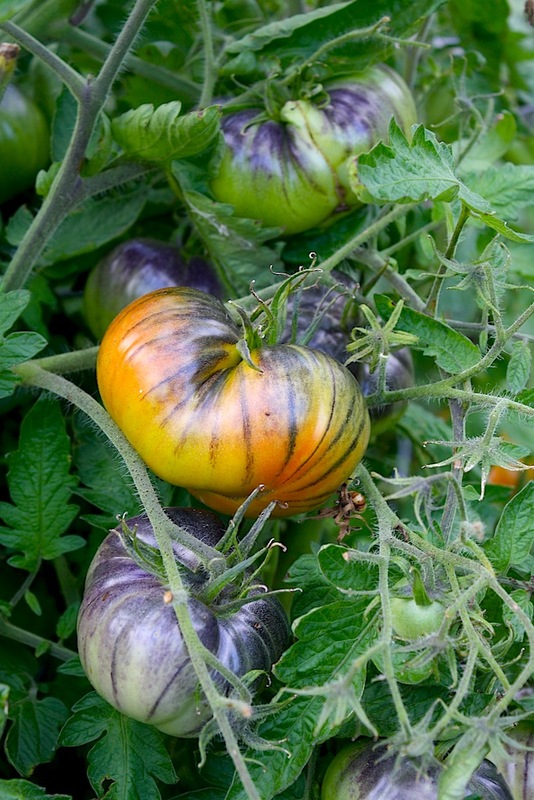 An exception to this may be with Aft fruit, where again anthocyanin appears to preferentially accumulate in the stripes (e.g. Siberian Tiger and Bengal Tiger). 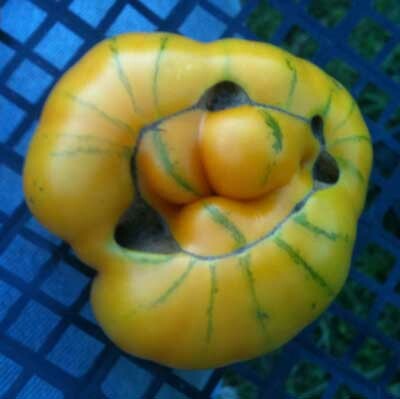 I’ve only seen this one example on a red/orange Aft fruit, so there’s more to learn here. Expression of the Fs trait is highly dependent on environment - a real frustration when it comes to breeding for these striking radial stripe patterns. 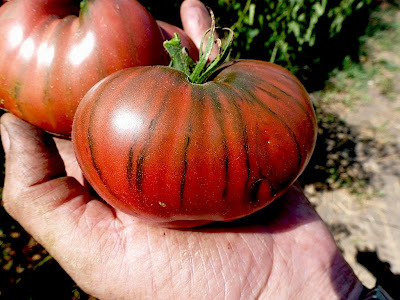 We believe there is a third unrelated striping pattern that is evident in some bi-color types. 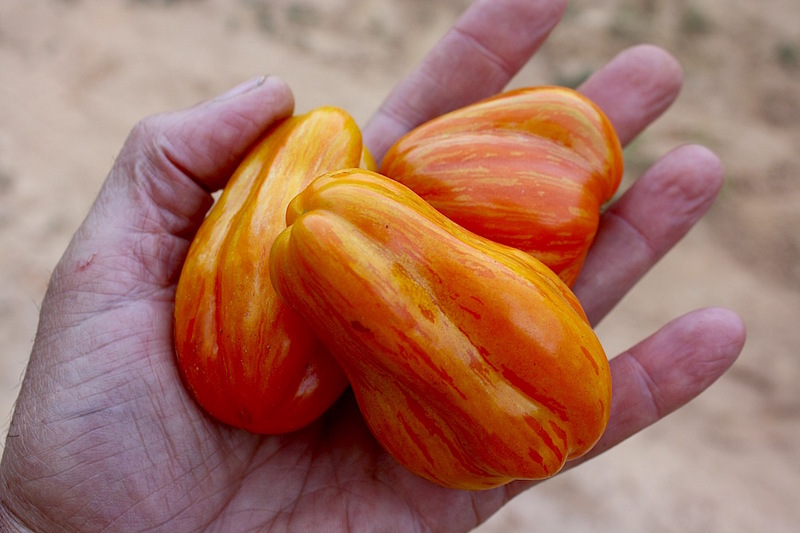 These broad (often red or orange) stripes radiate in a regular pattern from the blossom end, and I’ve only seed this in orange/red/yellow or green/red bi/tri-color type fruit. 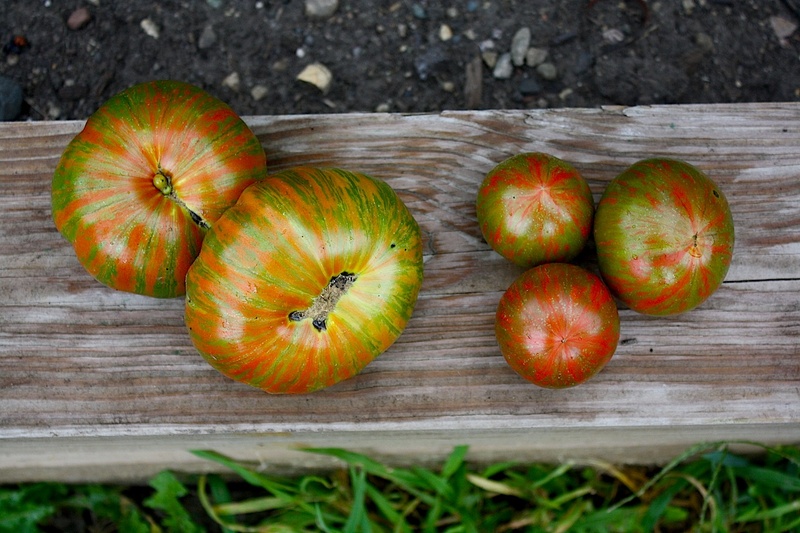 Unlike gs and Fs, these stripes are not evident on unripe fruit. 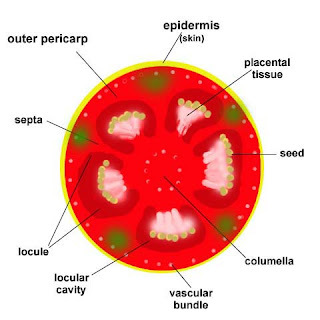 The color comes from below, rather than in the epidermis. 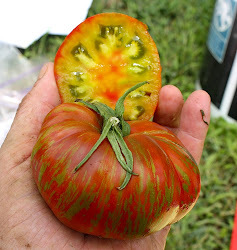 I think the Wild Boar Farms varieties Beauty King, Beauty Queen and Berkeley Tie Dye (BTD) are examples of bicolor types that may have both gs and radial bicolor striping (note: Gates says Beauty King was derived from a cross between the bicolor Big Rainbow and Green Zebra). I have not been able to find much in the literature on heritability of the bicolor trait in general or of this unique radial striping pattern – but based on F2 progeny from crosses with BTD and BK there is likely more than one gene involved, and the traits tend to both be recessive. 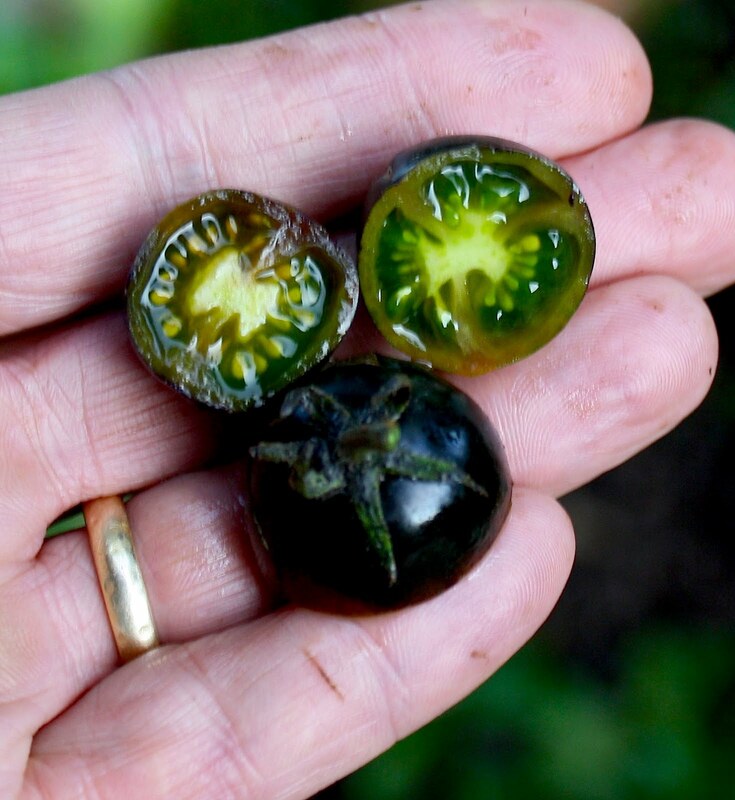 This summer we’ll have several unrelated breeding lines segregating for this pattern of fruit coloration – so more to come later. 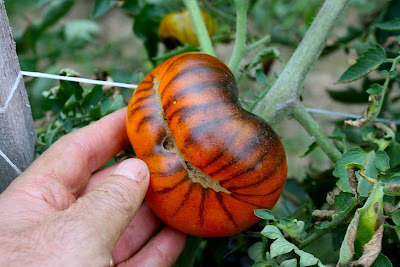 The interaction between these three independent traits, each resulting in a unique pattern of stripes on tomato fruit, and the effect of interactions with other genes (e.g. gf and y) on these traits make for a wide variety of striped phenotypes, and complicated genetics. Over the next few years it will be fun sorting out segregating progeny from crosses we’ve made between parents expressing these various genes.